Are Carrots Good For Your Eyesight? Do I Need Polarized Sunglasses? Home › Does Laser Eye Surgery Hurt? While IEHQ does not advocate laser eye surgery (such as LASIK), we understand that some of us feels that getting their eyesight fixed quickly is a necessity. Well, pain IS a powerful deterrence. After all, no one want to feel pain, especially when you have to voluntarily pay for it. 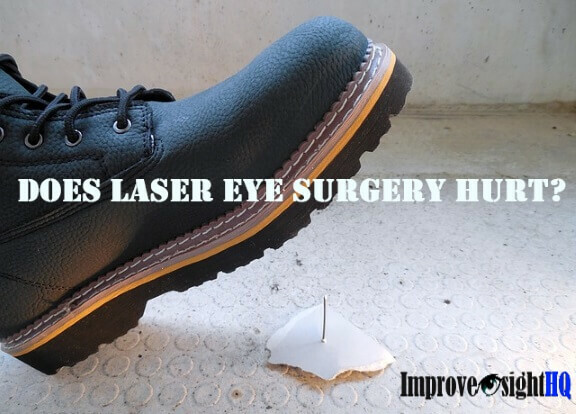 So what do you think of when you hear the word laser eye surgery? Do you imagine surgical knife slicing, needles poking or laser beams burning your cornea? Most people would imagine the whole process to be painful and scary, and potentially life debilitating (going blind) if a burning hot laser beam goes off tangent. Fortunately, that’s just a myth. Because the laser beam is actually cold. Okaay, on a more serious note, the short answer is that laser eye surgeries are generally not painful (no stitches involved), but one may expect to experience a certain degree of discomfort, often mild, during surgery and recovery. It is also important to note how your perception of the process can affect the level of discomfort experienced. For example, if you go into the procedure feeling extremely anxious, your heightened sense of awareness may make you more sensitive towards discomfort and pain. Likewise, if you are relaxed and feeling confident about the whole process and outcome, your experience of the surgery would most likely be more positive. So let’s start by going through the process of a typical laser eye surgery step by step to understand where potential physical discomforts may arise. There is usually at least two people in the room where the laser surgery will take place -your surgeon and a laser technician. The laser technician is the person who will calibrate the laser and you will hear sounds as he does the calibration. Do not be alarmed as the clicking sounds during calibration can get loud sometimes. Your surgeon will sit behind you during the procedure and give you instructions before proceeding. If you think you will be very nervous during the procedure, you can request for the surgeon to prescribe some medication to help you relax. To numb the eye, your surgeon will administer eye drops that serves as a local anesthetic, immediately before the surgery. These drops feel like any other eye drops, and as you blink, the drops will distribute across your eye surface, numbing it. The numbing effect will take place within a few minutes. The outcome is that you should not feel any pain during the procedure. 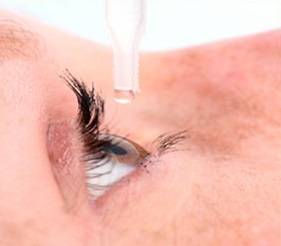 Your surgeon may continue to add a few more drops if your eyes do not feel sufficiently numbed. You will be alert throughout the whole process as it is a local anesthetic. To keep your eyes open during the surgery, your surgeon will place an wire speculum around your eyelids. Because your eyelids are not numbed, you will feel your surgeon setting up the speculum. The process feels like how you feel when you place two fingers to keep your eyes open when you put in contacts. You may feel your eyes adjusting to resist blinking. However, the sensation of clamped eyelids can be uncomfortable for some. If you are receiving LASIK treatment, your surgeon will start by creating a protective corneal flap by lifting the cornea to the side. The process requires suctioning, and you may feel pressure applied on your eyes when the suction ring is placed onto your eye. The sensation should fade relatively quickly, usually within a minute. If you have opted for PRK, the thin layer on top of the cornea called the epithelium will be scrapped off. For LASEK, the epithelium will be sliced and lifted to the side. You will similarly experience pressure during PRK and LASEK. Most people report this sensation of pressure as the least comfortable component of the actual surgery. You shouldn’t be feeling any discomfort for the flap creation or removal of epithelium since the local anesthetic has already been applied. This is the portion of the surgery where the laser is actually utilized. The cornea is reshaped by focusing the laser onto the eye. This process usually takes no more than a minute. Contrary to popular belief, the process is relatively pain free. In fact, most people report not feeling any additional sensation, other than having to look into a light while the laser is being used. Although, just to prep you on potentially disturbing note, even though it is relatively pain free, some people may detect a burning odor during the procedure and this stems from the laser work. If you are doing LASIK, the surgeon will then replace the cornea flap to let it function as a natural bandage to help with the healing process. The rebonding process of flap to cornea takes place naturally within minutes. For PRK and LASEK, the epithelium will be placed back and kept in place with soft contact lens. With the surgery done, you will be advised to rest your eyes very frequently during the first day, and very likely given protective eyewear to wear as you return home. Immediately after surgery, your vision may be blurry. You may also feel sensitive towards light for a few hours. Your surgeon can prescribe some eye drops that can alleviate the discomfort. The numbing sensation of the eye drops administered during surgery will wear off, and you may feel a bit of irritation around your eye as it starts to heal. Some people report feeling mild to moderate discomfort, possible burning sensation or/and watery eyes. Other report having dry eyes (especially so for LASIK patients) which can feel uncomfortable. As the epithelium heals much more slower than the cornea flap, the healing process for PRK and LASEK patients tends to be longer than LASIK patients. Pro tip: Take a nap as soon as possible after your surgery. Many people noticed that taking a nap post surgery can help to relieve the symptoms of discomfort immensely. If you are worried about discomfort, you could either get your surgeon to give you a prescription for pain medication, although most over the counter pain medication and lubricating eye drops can alleviate the discomfort quite easily too. Should your discomfort elevates significantly, despite taking the medication, do inform your surgeon for further advice. So, to return to the question “ Does laser eye surgery hurt?”. Typically speaking, the process itself should not be painful, but do expect to experience a certain degree of discomfort during recovery. Uncertainty and fear of the process can also exacerbate any negative response towards the procedure. Hence, it would be very helpful to discuss your fears with your surgeon to gain a realistic picture of the procedure so that you can help manage your expectations to create a more favorable outcome! Try A Bottle For Free! Read My Review On Ocu-Plus Formula. My grandma is old school. I’m talking oatmeal baths for chicken pox and yes a little bit of your urine in your infected eye. It worked when she did it. I afraid I’m blind nd .. I just found out my eye the black one turn colour to brown . And the shape of circle isn’t tat circle . Am I blind soon? Copyright © Improve Eyesight HQ 2012 - 2018. All rights reserved. Important Disclaimer: All information given here are for educational purposes. The claims on this website have not been clinically proven or evaluated by the FDA. Improve Eyesight HQ is a participant in the Amazon Services LLC Associates Program, an affiliate advertising program designed to provide a means for sites to earn advertising fees by advertising and linking to ImproveEyesightHQ.com.